qualification can apply for these Peon jobs before 25-11-2017. Application forms on a plain paper affixed with photograph on its top with candidate complete bio-data, attested copies of relevant documents/ certificates, 2 self addressed postal stamped envelopes should be reach to the Office of the District & Sessions Judge, Hisar through post or by hand. Minimum age limit for Peon Jobs is 18 years and Maximum age limit applicable as per Haryana Government instructions. 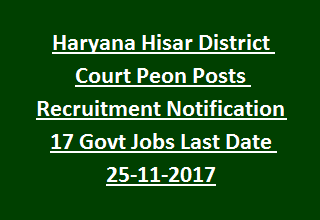 Selection for Peon vacancies in District Court Hisar Recruitment is Based on candidate merit in Interview. Date and Venue of the Interview will be announced on 15-12-2017 on court notice board as well as on District Website www.ecourts.gov.in/india/haryana/hisar/circulars-notices. Pay scale for the post Peons is Rs. 4440/- to Rs. 7440/- plus Grade Pay of Rs. 1300/- admissible as per rules. Further details regarding Qualifcaitons, Available vacancies, Age relaxations, Pay Scale, Application Procedure of Hisar District Court Recruitment, see the notification. Total vacancies available in Hisar District Court Recruitment are 17 posts. Candidate must have passed 8th class from recognized Board. See the Notification for further details. Salary for Peon posts is Rs. 4440/- to Rs. 7440/- plus Grade Pay of Rs. 1300/- per month, admissible as per Haryana Govt rules. Minimum age limit for Peon Jobs is 18 years and Maximum age limit is 40 years as on 01-01-2017. Age relaxations admissible as per the instructions of Haryana Government rules. Candidates applying for Peon Jobs in District Court Hisar Recruitment is based on Interview. Date of the Interview will be announced on Court Notice Board and District and Sessions Court, Hisar Website on 15-12-2017. No separate call letters shall be issued. Candidate must submit application forms on a plain paper with complete biography, affixed with latest photograph on its top. Application form with self attested copies must be reached to the office either by registered post or by hand before 25-11-2017.